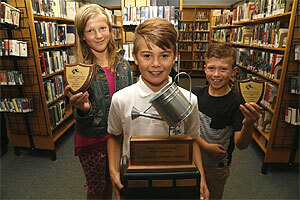 Kaden Koutroulides, centre, of Demorestville wins the Prince Edward County Master Gardeners’ Children’s Gardening trophy. Trophy awarded on Saturday, October 6, 2018 at the County of Prince Edward Library and Archives in Picton. A weed is a plant whose virtues have not yet been discovered.